Accused 30.08.1865 of being open out of hours on the previous Sunday. Fine of 5s and 11s costs. (age 45 in 1871 and address as King Street. 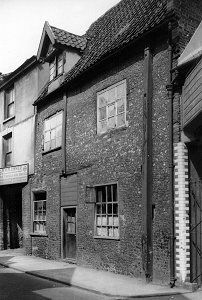 Title deeds dated 26th March 1765 confirm that the property was owned by Anne Hainsworth, widow of the City of Norwich and conveyed at that time to Isaac Jackson. The location given as Conisford Street and that the Southwest Great Gate formed part of the boundary. The property included two stables and Coach house thereunto or adjoining. Offered To Let 10th December 1778 - Enquire of Mr. Jackson's Brewing Office, in Conisford. Again to Let 14th May 1784 - Enquire of Mr. William Fitt, All Saints, Norwich. As the GREEN MAN when offered for sale 12th May 1788. Lot 3 - Then the property of the late Isaac Jackson. Described as `with Barbers Shop adjoining'. At the sessions held Monday 21st May 1864, Mary Ann Francis accused Elizabeth Howlett of assault. The magistrates viewed this as a case of jealousy between the two parties and dismissed the case. 138 barrels of beer and 38 gallons of spirits sold 1894.